FTC : I requested this from NetGalley for a fair and honest review. 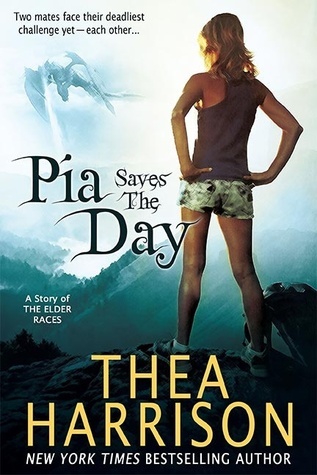 I loved this novella, loved watching Pia and Dragos rediscover their love and I always love more about the peanut 🙂 Readers beware; this novella contains many spoilers for the rest of the series so I wouldn’t read it out of order. I loved this story. Not only did I get to see them fall in love all over again (Dragon Bound is my favorite in this series) but I got to see Pia in action. As the title states, she does in fact save the day and I loved her strength. Her mate was injured and she had to pick up the slack, which she did impressively. She had a plan for everything and her resilience was astounding; Dragos was not the star of this show, Pia was. She could have broke, she could have let the sentinels deal with it but she pulled herself together and did everything she could to put her family back together. She was the epitome of a strong woman; she wasn’t a bull-buster, she was simply a woman who did what she had to with no fuss. I can’t wait to see more of Peanut’s story but this wasn’t about him. This was about Pia and Dragos. It is full of moments of love, strength and determination which made it even more enjoyable to read. An absolute must read.